This is a wonderful side dish to serve alongside grilled chicken, steak, or simply served as an appetizer at happy hour. I love the tangy miso-yogurt sauce and have been drizzling it on everything! Grilled chicken, cooked lentils, steak and salmon. However, this version right here is my favorite. When paired with the sweet, earthy, caramelized vegetables it makes for a simple crowd pleasing side dish. Feel free to make a double batch as the sauce will keep in the fridge for up to one week and is great to have on hand to quickly jazz up any meal. This platter of veggies can be served finger food style or you can fork and knife it on small plates. Go wild! Combine the yogurt, miso, honey and vinegar in a bowl. Whisk until smooth. Taste for seasonings and adjust as needed. Top with toasted sesame seeds and set aside. Preheat the oven to 425F. 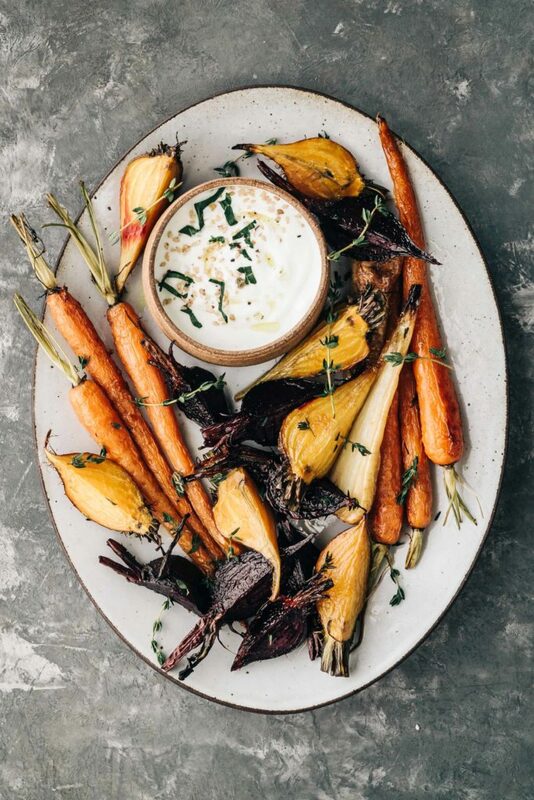 Toss the beets and carrots with the thyme sprigs, olive oil and sprinkle with salt and pepper. Roast in the oven until tender and lightly browned. About 35-40 minutes. toss halfway through cooking. I don’t calculate the nutrition on my recipes (and never have) so you may be thinking of another website. I hope you enjoy the salad!